Our passage is a prophecy that is precious to all saints. Isaiah speaks of the Lord Jesus receiving the awesome punishment that each of us rightly deserves. The verse begins with the word “all” and ends with the word “all.” The word “everyone” is sandwiched in the middle to assure us that God means everyone without exception. First, the verse states, all we like sheep have gone astray. I’m reminded of a sheep that went lost several years back in New Zealand and was presumed dead. 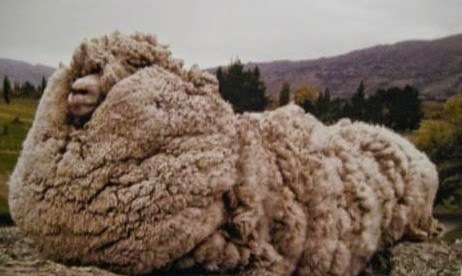 It made national headlines when it was found a longtime later with its wool so large and thick that it earned the name Shrek. In fact, it hid out in caves and dens until its coat weighed 60 lbs. However, Shrek is a very rare case. Most sheep who wonder off are living against the clock. It is only a matter of time before they meet an untimely death. Sheep are sometimes called the dumbest animals on earth. Although their I.Q. may be closer to cattle, some of their documented behaviors are so bad that they are legendary. In fact, they are not only vulnerable to predators, they have to be protected from their own risky actions. This is why they need either a shepherd or to be pinned up in a safe area. Once a sheep has gone astray there is little chance it will find its way back home. This is a picture of all people… We all, like sheep, have gone astray. We have “wandered off” from the safety of God and His precepts — whether we consciously know it or believe it. This is part of the analogy of the relationship between man and sheep. We generally see neither our own errors nor the danger those errors have put us in. The next part of the verse tells us; We have turned, everyone, to his own way.” At first glance, the casual reader may respond, “Well, isn’t that what we are supposed to do? Are we not all supposed to do our own thing and live our own lives?” It seems correct to say, “Yes! Of course!” We are used to politicians and motivational speakers encouraging us to control our own destiny and achieve the American Dream. However, this is nothing more than the Devil’s self-centered philosophy. He pioneered the attitude of asserting his own corrupted will in place of God’s will. For that, he was banished from Heaven for all eternity. Modern western culture is about the greatness of the individual. People are made to desire stardom and wealth (fame and fortune). Nevertheless, the government of God is not a democracy, it is a kingdom. This is a radical departure from a democratic society. Seeing this tension, some people try a “hybrid” between kingdom and democracy, but it cannot work. When we breathe our last breath, everyone will realize that there is a kingdom where God rules absolutely. All our lives we in the West have been used to having control of our destiny — as well as voice and vote within the government. However, this has never been the case, nor will it ever be the case within the Kingdom of God. Each one of us either is doing, or at one time did, what they wanted to do — to the exclusion of what God thought about it. In the kingdom of God the will of God is done 100% of the time. In the language of the time of the Judges we read, In those days there was no king in Israel, but every man did that which was right in his own eyes. (Judges 17:6, 21:5) This is the essence of all sin — me being in charge of my own life doing what is right in my own eyes. Yet, this type of life nothing more than slavery to Sin. As Jesus said it in John 8:34; “Most assuredly, I say to you, whoever commits sin is a slave of sin. (NKJV) Everyone is going to serve someone or something. Nobody lives in a vacuum. The question is, what kingdom are you and I going to submit to? A lot is said about freedom in Christian circles. There are hundreds of books on freedom. Sermons on freedom. I recently performed a contemporary Gospel song query and found over 100 songs that contain the word “freedom.” Many people speak of freedom as the release of inhibitions in public worship. Others see it as being free from their past sin or past life and identity. Yet, freedom can be a deceptive concept. Understand that no one but God is truly “free.” The rest of us are slaves to someone else. The question is, who or what are we a slave to?